Peter Munk, the founder and chairman of gold mining giant Barrick Gold, has again stuffed the coffers of the University of Toronto with a recent $35 million donation to the school. The donation pays for establishment of the Munk School of Global Affairs, while the Centre for Comparative Literature and the Centre for Ethics are shutting their doors. This follows Munk’s previous gifts totaling $25 million for the creation of the Munk Centre for International Studies. With these two donations, Munk has effectively branded entire areas of international study, including Public International Law, International Development, and Global Policy Analysis. This is not unlike Munk’s previous donations to the University. The U of T’s student paper, The Varsity, made public the conditions of his previous donation of $6.4 million to establish the Munk Centre for International Studies. According to information gathered through the U of T’s Access to Information Policy, the student paper uncovered an agreement that had been signed two years previously without consultation with the academic board. The $6.4-million donation, to be paid over 10 years, came with conditions stipulating that a council set up for the centre would have to cooperate with the Barrick Gold international advisory board. Another condition forbade the university from cutting Munk Centre funding for 30 years, which would amount to an opportunity cost for other departments during periods of government cutbacks. According to The Varsity, this contract was later amended due to outcry from the University’s Faculty Association. As a company that is accused of human rights violations, labor violations, environmental devastation and/or corruption in nearly every country where they operate, students have cause for concern that their school is so closely connected with this company. But the Munk donation has more implications than merely undermining the reputation of the University of Toronto. Last October, the Harper government appointed the founding director of the Munk Centre, Marketa Evans, to the newly formed post of Corporate Social Responsibility (CSR) counselor. Her job is to assist companies and stakeholders in the resolution of disputes related to the corporate conduct of Canadian extractive companies (mining, oil and gas) abroad. Criticized for her performance so far, Marketa has yet to pursue a single investigation. Also, as a requirement of her post, she requires consent from a mining company before she can review any allegations against that company. Marketa’s promotion to this post raises questions about how the prestige of the University is being used to get people favored by industry into government posts. It also raises concerns about the bias of the 19 faculty of this new School of Global Affairs and it’s emphasis on the study of Corporate Social Responsibility, which is largely supported by industry as it emphasizes voluntary standards and avoids government regulation. As the negative impacts of extractive industries have become undeniable, the question of how to mitigate these impacts has finally come to the fore. The Munk donation has turned the University into an ideological battleground for a political match that will shape the next era of corporate globalization. The venue has been chosen; now, it’s up to the students to step up to this opportunity and become a voice in the debate to end corporate impunity. I suppose this type of ruthless self promotion could also be a way to discredit the negative public opinion generated by Barrick’s mining operations abroad. On the other hand when someone is on a giant public pedestal like that, especially one with a shaky foundation, it might make it that much easier to knock them down. Pingback: No more “Iran experts”, but U of T still a training ground for empire « whose campus? 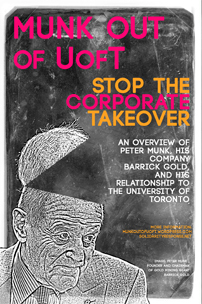 Learn more about the Peter Munk OUT of UofT campaign! Join our e-mail list! Primer on Mine Water Pollution in Canada: Are Waters & Fish Habitat Protected?